As an avid follower of their online boutique Totokaelo, I was very excited to find in my newsfeed this morning, the launch of their sister website featuring thoughtfully curated art and objects. A beautiful compliment to their existing selection of to die for fashion. 1. Score & Solder Table Rhombus Planter, 2. Akiko's Pottery Tiny Spoon, 3. Hasami Wooden Tray 4. Mato Creative Recycled Apparel Braided Market Basket. 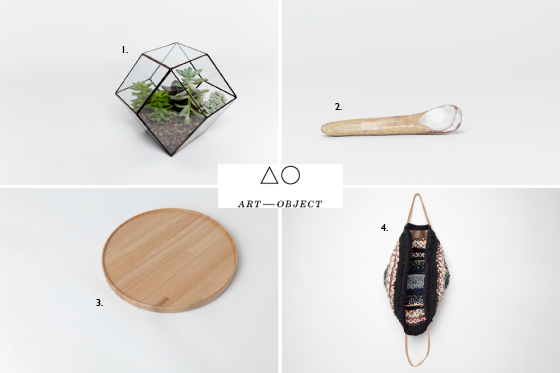 beautiful objects. i am loving your blog! so flattered to have been featured on her blog!